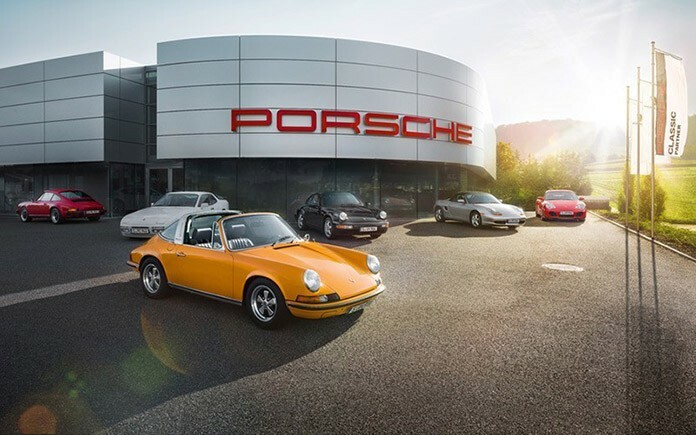 The world’s first Porsche Classic Centre is just about to open: from 26 November 2015, the Porsche Classic Centre Gelderland, just outside of Arnhem/Netherlands, will be offering services for classic cars of all ages from Zuffenhausen. This is the first time that service, workshop and sales exclusively for the classic sports cars have been brought together under one roof. A small number of additional certified Porsche Classic Centres are set to follow around the world and produce an even more closely knit Porsche Classic network. More than 70 per cent of the vehicles ever produced by Porsche are still running today. To ensure that these classic cars receive optimum support and overhaul facilities, Porsche is establishing an international dealer and service network with some 100 centres to reach completion by 2018. This mainly involves Porsche centres which will provide support for sports cars of earlier eras in addition to the current models and will be certified as Porsche Classic Partners. Porsche customers and potential customers can expect the complete range of Porsche Classic services from the Partners. These services will not only include the supply of some 52,000 original spare parts, complete and partial overhauls but also repair and maintenance work and the sale of classic cars. The Porsche Classic Partners will be setting up a separate area for this purpose with classic vehicles on display and current spare parts together with technical literature and information. At present, the network comprises 24 Porsche Classic Partners around the world. Ten of them are in Germany, the others in Estonia, France, the United Kingdom, Italy, Japan, Switzerland, Hungary, South Africa, Thailand and the United Arab Emirates. Locations where new centres are being developed include Australia, Belgium, Canada and the USA. The Porsche Classic Partners offer customers with their historic Porsche vehicles a local contact who combines service and advice with expertise. Employees complete a special training concept, which Porsche has developed specifically for this purpose. This enables them to provide classic car customers with expert and detailed information on damage patterns typical for every type of vehicle, the appropriate precautionary measures and suitable repair options. To ensure the best possible level of service and repair, Porsche Classic Partners are equipped with special tools and model-specific repair instructions. In this way, Porsche is able to guarantee a uniformly high standard of quality at all Classic Centres.